As Indiaa��s first ska band a�� the genre that began in the 50s in Jamaica and is a precursor to reggae a�� The Ska Vengers really do bring the energy and edge that the music is known for. a�?We play music with a Caribbean influence. Ska started to capture the energy of the post-independence era there but also had a darker, mischievous rudeboy (a slang from Jamaican street culture that is the equivalent of gangsta) element to it,a�? begins Delhi Sultanate, ( originally Taru Dalmia) lead vocalist. 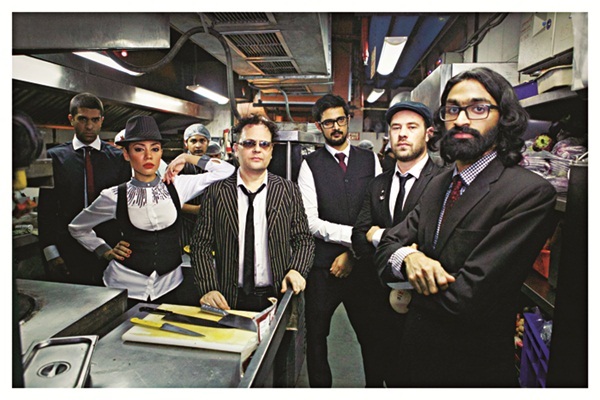 Heading to blueFROG this evening to launch their new song and video Frank Brazil, Sultanate tell us that the personal story of Indian revolutionary Udham Singh inspired the track. a�?His story is remarkable and yet it is surprising how not many people have heard of him. He was the first person from the colonies to travel back to the metropolis and assassinate a colonial official, following the Jallianwallah Bagh massacre. His story raises questions about who has the right to legitimately produce violence,a�? he philosophises, as lead vocalist Begum X (or Samara Chopra) elaborates that the name Frank Brazil was actually the alias of Singh. a�?We had been listening to a lot of calypso music which pushed boundaries of free speech. We came across an album called Murder a�� Songs from the Dark Side of The Soul. It was our introduction to murder ballads and Frank Brazil is our version of the genre,a�? she explains. The video (also releasing today to mark Singha��s death anniversary) tells the story of Singh in a graphic novel meets film noir style. At the gig, you can expect other new tracks such as Jewel Thief and Jail Song. a�?We will play without our horn section, which means the rest of us will have to bring even more energy. So expect Indian raggamuffin music,a�? says Sultanate. And if that isna��t enough, Begum X hints at their second album being completed and heading for a winter release.